While not technically a food, drinking water is by far one of the best things you can do for your skin. Water hydrates your skin from the inside helping to address issues with dryness, while also flushing out toxins that could affect the health and appearance of your skin. Avocados are a good source of vitamins A, C, D, and E and are also packed with good, healthy fats that can help benefit your skin’s elasticity and hydration while also helping to protect it from sun damage. Avocados are also a natural anti-inflammatory which can help to reduce puffiness or the size of a blemish. Broccoli is full of antioxidants, vitamins A, C and K, copper, zinc, lutein, and sulforaphane. Lutein helps to prevent skin from becoming dry or wrinkled. Sulforaphane neutralizes free radicals helping to protect from sun damage. Vitamin K helps heal bruises or improve the appearance of under-eye circles, while vitamin C helps to fight signs of aging. 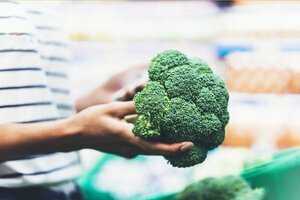 For more information about the health benefits of broccoli for your skin and your body click here. Other green vegetables that are good for your skin are kale, spinach, and arugula. Kale is a popular ingredient for smoothies, soups, and salads because it is high in antioxidants and nutrients including vitamin A. Vitamin A is also a key ingredient in retinol, which is used for improving the appearance of fine lines and wrinkles. Spinach is another leafy vegetable rich in vitamin A, as well as iron, B vitamins, and omega-3 fats all believed to be beneficial for healthy hair, skin and nails. Arugula contains significant amounts of sulfur, which can encourage the production of collagen. Click here to learn more about greens to add to your diet for better skin and hair. Salmon, mackerel, and herring are good sources of omega-3 fatty acids that help to keep skin moisturized and are also helpful in reducing inflammation, redness, and acne. Fatty fish also provide a good source of vitamin E and zinc, which both work to fight inflammation. Walnuts are another great source of omega-3 fatty acids that reduce inflammation in the skin and throughout the body while also encouraging collagen production and improving skin elasticity. Walnuts also contain high levels of zinc, vitamin E, vitamin C, selenium and protein that will play a key role in keeping your skin healthy. Sunflower seeds are packed with high amounts of vitamin E, zinc, protein, and selenium. Selenium is a powerful antioxidant that can benefit skin in many ways including protecting cells from damaging free radicals, fighting skin infection, irritation, and inflammation, and even improving skin sensitivity. You can read more about the many skin benefits of selenium by clicking here. Oranges, carrots, spinach, and sweet potatoes are all foods containing significant amounts of beta-carotene. Beta-carotene is an antioxidant that is converted into vitamin A helping to maintain healthy, glowing skin. It can also help reduce the skin’s sensitivity to the sun and improve the effectiveness of sunscreen. Vegetables are not the only foods good for your skin; research has shown that dark chocolate is another food beneficial to healthy skin. According to various studies, eating about an ounce of dark chocolate a day can result in better skin hydration, reduced sensitivity to sunburn, and increased blood flow to the skin. Make sure you limit yourself to one or two ounces of dark chocolate with higher levels of cacao (at least 70%) rather than its more sugary counterparts, milk or white chocolate.